Is Technology the End of Live Agents? Intuitively it might seem that technical advances, smart technology, and artificial intelligence would mean the eventual end of live customer support. However, the opposite is true. A brand’s customer experience strategy should be focused on the live agent more than ever before. 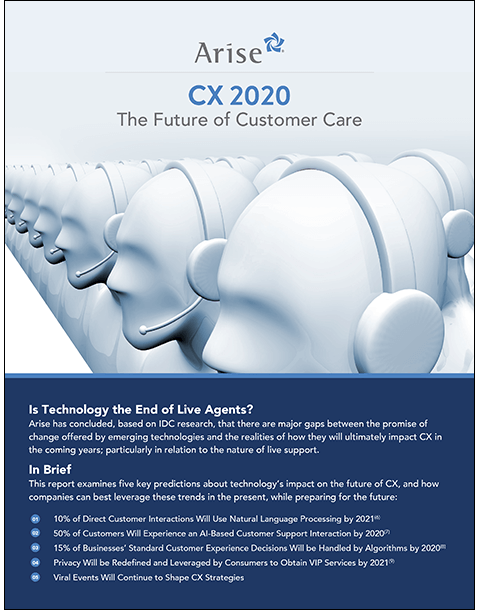 With customers being largely underwhelmed by the levels of service they are receiving, digital advancement handling the “low hanging fruit” of the customer experience, and viral events being more and more impactful, the quality and availability of agents should be key focuses for any organization that wishes to be viewed as customer-centric. Arise has concluded, based on IDC research, that there are major gaps between the promise of change offered by emerging technologies and the realities of how they will ultimately impact CX in the coming years; particularly in relation to the nature of live support. 2. How many agents are in your contact center? 3. What is your industry?